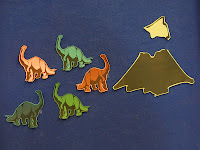 I love having the opportunity to do craft storytimes with older kids (ages 4-8) during the summer -- not only do we get to make cool and fun things, but I get to read books that otherwise I would be unable to read to my toddlers & preschoolers because of the length. Such was the case today! 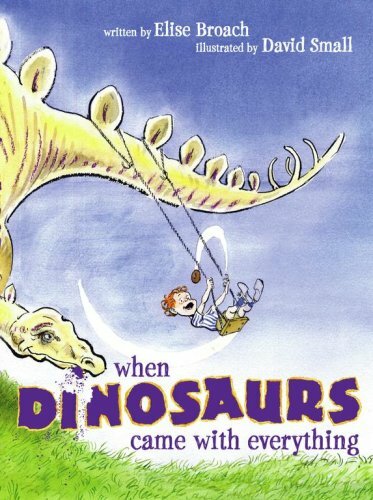 When Dinosaurs Came With Everything by Elise Broach, fantastically illustrated by David Small -- this is one of my favorite dinosaur books, but due to the length I usually can't read it at storytime. Since I did not have time to turn this into a prop with flannel pieces, I had to take the lazy man's shortcut and use images printed onto cardstock. Worked just great - and now I plan to turn this into a full-fledged flannel rhyme for future use! And along came a friend with a CRASH! BANG! PLOP! ood, easy crafts for kids in preschool and early-elementary. 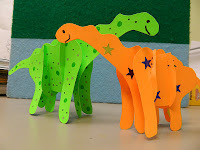 We made a 3-D dinosaur using cardstock, scissors, markers and stickers. Fun, cute and easy! I agree! Your dinosaur craft is very cute! Love it! I will have to check out that book for craft ideas. Thanks!